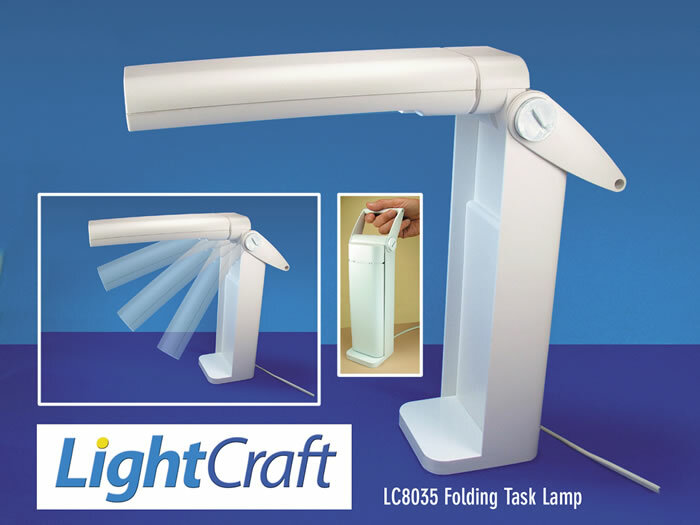 Quality LIGHTCRAFT® task lamps brilliantly illuminate all sorts of activities. Perfect for extra office or workspace lighting, the compact, portable LC8035 Folding Task Lamp automatically switches on when unfolded – and sports a 13 watt fluorescent tube, built-in handle, stable base and generous 1.5 m (59 in) power chord!
. . . and more! The handy, energy-saving SHESTO devices offer virtually shadow-free light with low heat emission for superior luminosity, convenience and economy. The economical, portable LC8035 Folding Task Lamp, for instance, superbly lights a wide range of work and pastime applications. Just 25 cm (9.84 in) high, the compact item automatically switches on when unfolded – and sports a 13 watt fluorescent tube, built-in handle, stable base and generous 1.5 m (59 in) power chord. It’s perfect for extra office or workspace lighting!